Pets are welcome here at anytime ! Located in the heart of historic Noyo Harbor, this cozy and romantic vacation home will win your heart and serve as the perfect home base for your Mendocino Coast adventures. Whether you prefer to use this “large-scale tiny home” as a launching pad for fun escapades and days jam-packed with outdoor activities or for a mellow and relaxing vacation by the seaside, the “San Juan” is the perfect place to stay. Experience the beauty of harbor life: watch the boats come in, listen for the famous foghorn, and savor fresh-caught fish (or vegetarian delicacies) at the excellent restaurants just steps from your front door. Finally, after a long day of exploring, sink into your luxurious and comfy bed and fall asleep to the sounds of the lapping waves, the fresh coastal breezes, and the lively local wildlife. With a fully-equipped kitchen, living room, bedroom, bathroom, and loft, the “San Juan” has everything you need for the vacation of a lifetime. The home feels larger than its ~620 square feet (370 square feet downstairs and 250 square feet upstairs in the loft). 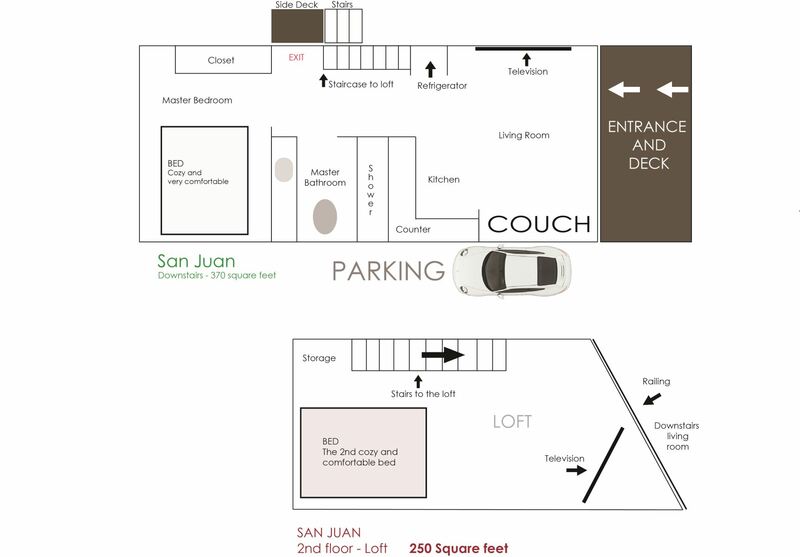 The maximum capacity for San Juan is 4 people, with a queen bed in the downstairs master bedroom and another queen bed in the small bedroom in the loft. The home features clean, modern furnishings and accessories, while the loft TV room has a “groovy vibe” and cool retro bean bag chairs. Since this is a working harbor, the sounds of harbor life might not suit light sleepers, but if you like unusual environments and new experiences, then you are in for a treat! Let the barking seals, the soothing harbor foghorn, the boats coming and going, and the tide lull you into a blissful and calm state. Note: Please be aware that the bedroom and TV area in the loft have low ceilings. Noyo Harbor was first established as a port for logging and fishing back in the late 1800s. The Noyo Harbor is an active, fully operational harbor, and is the first such harbor north of San Francisco Bay. The harbor is reminiscent of the famous Cannery Row in Monterey, which includes fisheries and a full marina with classic and vintage fishing vessels of all types. The harbor is a wonderful place for seal-watching, kayaking, or just sitting back and enjoying the foghorn and the coming and going of boats. There have been many classic movies and T.V shows filmed here through the years, including The Russians Are Coming, the Russians Are Coming! (1966), Humanoids from the Deep (1980), Overboard with Kurt Russell & Goldie Hawn (1987), and the T.V series Murder, She Wrote (1980s). The bed in the downstairs master bedroom features a luxurious top-of-the-line mattress from FloBeds and cushy pillows to accompany it. The upstairs loft has a super-comfy Tuft n Needle Mattress. You can rest assured (no pun intended) that when it's time for bed, you will sleep well each and every night. No climbing on the railing at any time. Children must be supervised at all times on the wharf. Located directly on the docks in Noyo Harbor in Fort Bragg, California. Noyo Harbor is a great place to take a stroll and check out a historic, working harbor up close. There is plenty to see and do (and eat). Noyo Harbor is home to some of the coast’s best restaurants, all within walking distance of your vacation home, so you have easy access to great food, refreshing drinks, spirited live music, and more. The downstairs master bedroom has a super high end and super comfy Mattress from Flobeds with accompanying pillows to go with it. The upstairs loft has a super comfy Tuft n Needle Mattress as well so know that when it's bedtime, you will have a super comfortable sleeping experience each and every night. What a treat! The San Juan was so clean and cozy! We had everything we needed. The kitchen was fully stocked with the necessary amenities, and there were extra towels in the bathroom. They include throw sheets if you decide to bring your fur babies (to keep the furniture clean). The host was quick with her responses and had lots of good tips for places to eat and things to do. This house was really perfect for our family birthday weekend in Fort Bragg. My kids LOVED the loft. The house is really clean and has all the amenities you need. The location is great and perfect for morning and evening walks. You are surrounded by great restaurants in walking distance. Such a wonderful little home away from home. Loved staying in Noyo Harbor. Definitely recommend it if youre looking to learn and immerse in fishing and seafood. The house was impeccably clean - the cleanest Airbnb Ive ever stayed in! Loved having it for our home base while we explored the harbor and other parts of the Mendocino/Fort Bragg area. Carlon was extremely accessible before and after. My boyfriend & I loved staying at the San Juan! There great place to eat I walking distance from the home with a great view of the harbor. We enjoyed eating out but also loved they we were able to cook at home when we wanted. It was a great relaxing trip & will definitely be coming back! Highly recommend the San Juan for a stay in the Mendocino area. The unit is nice, clean and included everything we needed. It was perfect for our family with small kids- within walking distance to the water or meals out. We were able to cook and eat in when we wanted, and the kiddos loved the bean bag loft! Responsive and welcoming hosts. This is the cutest little house in the perfect area. Everything is close and convenient. Walking distance to food,drinks and the beach. It was clean and spacious. We really enjoyed our stay and will return when the baby is older, maybe even upgrade to a unit closer to the water to soak in those sunsets! The host was quick to respond with any issues and made us feel welcome. Highly recommended! Our Tiny home San Juan was so adorable! It had everything we needed plus some! Super clean! It is located in a very central location and is down by the harbor. I felt like I was camping in very good style. Wonderful company and property. We will be back! Wow! What a fantastic trip we had- every expectation was met and surpassed. Super communicative hosts, brand new unit, the setting in the harbor was both naturally beautiful and funky port vibe. You can not get more classically, quirky, seaside than staying in the Noyo Harbor. Honestly, can't wait to plan our next trip and see the Harbor in the summer. 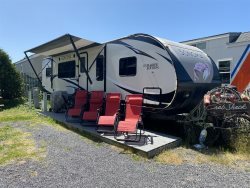 This rental is located in a classic, old school RV park that have been in the harbor for decades. I personally think that is adds to the rustic harbor experience but there are some who do not like being in an RV park. Please look through all of the photos on this rental so you can get an idea of what the park is like so you can make a personal determination if this is right for you . The house binder on the kitchen counter has just about all the information you might possibly need and probably a little more. There are 2 Television sets in the home, one in the living room downstairs and another in the Beanbag room in the loft. The instructions for both TV's are in the binder towards the back for your convenience. There are garbage cans for the trailer park at the inside entrance to the park on the left side when looking back from the unit. There is room for one vehicle which can park directly beside the unit. If there is need for a second vehicle, please reach out to us so we can try to accommodate if possible. Since the parking is right beside the unit and there are other units close by, please try to be as quiet as possible early in the morning and late at night. Thank you !